Griechenland und die Ionischen Inseln mit Beachtung der Klassischen Zeit. 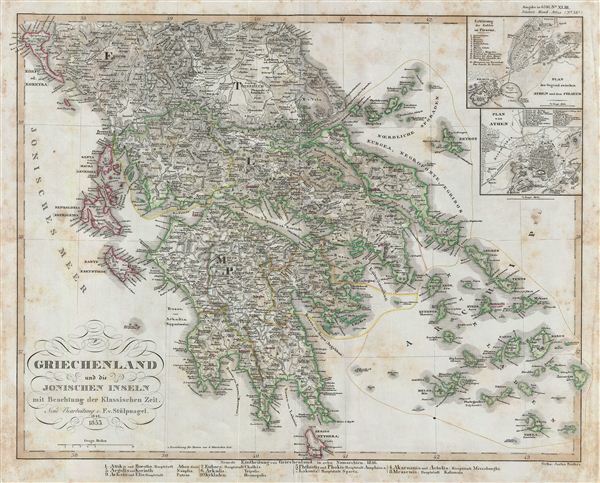 A fascinating example of the 1853 Justus Perthes map of Greece and the Ionian Islands during the Classical Period. The map covers from Corfu to Cerigo, including the Ionian Islands, euboea, the Cyclades, and the Sporades. Two inset maps in the upper right quadrant detail the area between Athens and Piraeus, and the environs of Athens. The classical period in Greek history, which lasted from the 5th century B.C. through the 4th century B.C. greatly influenced the Roman empire's politics, art, architecture, philosophy and literature. Throughout, the map identifies various cities, towns, rivers and assortment of additional topographical details. Political and regional borders are highlighted in outline color. Unlike other cartographic publishers of the period, the Justus Perthes firm, did not transition to lithographic printing techniques. Instead, all of their maps are copper plate engravings and hence offer a level of character and depth of detail that was impossible to find in lithography or wax-process engraving. All text is in German. Designed and drawn by Friedrich von Stülpnagel and issued as plate no. 38c in the 1854 edition of Stieler's Hand-Atlas. Very Good. Moderate overall foxing. Original centerfold reinforced on verso. Blank on verso.